The Presidential Task Force on Combating Illegal, Unregulated and Unreported Fishing and Seafood Fraud is poised to make important decisions that will enhance sustainability, protect honest fishermen and seafood businesses, and ensure that consumers are protected from health risks and economic fraud. One simple but vital step the federal government can take is requiring the use of species-specific names — one name, for one fish — throughout the seafood supply chain, from the fishing boat to the dinner plate. For documentation and tracking the fish through the supply chain, the Latin scientific name is universally recognized regardless of language and is already used on many regulatory documents around the world, providing a unique identifier for every species. 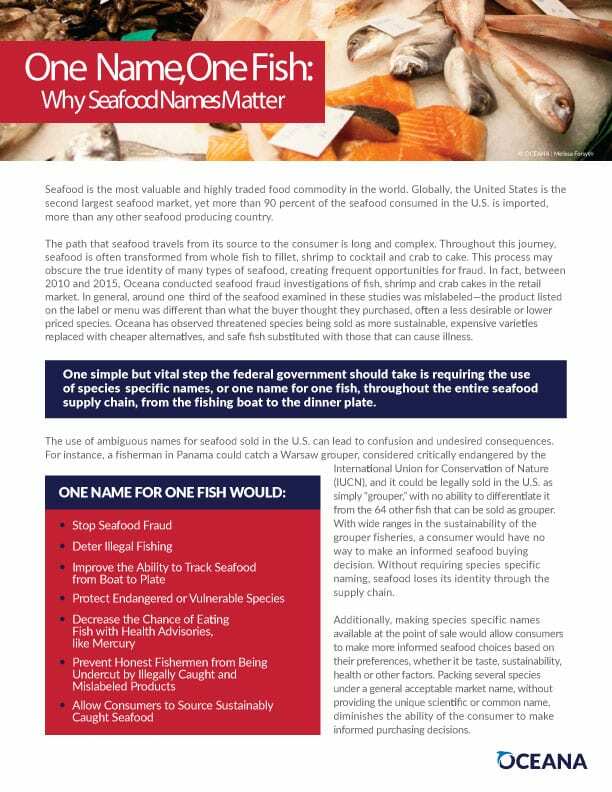 If the species-specific name of every seafood product were required to accompany the product in question from the boat to the plate, it would be easier to prevent and deter seafood fraud. Additionally, making species-specific names available at the point of sale would allow consumers to make more informed seafood choices based on their preferences, whether they be taste, sustainability, health or other factors.